Please click on the darker arrow to your right to view more photos. A view of the gross anatomy room. A view of the preclinical building. GUVMA Common Room "The Hut"
View from the back gate. The path towards Wolfson hall. Weipers Centre for Equine Welfare. The back of Weipers Centre. This building houses the assembly hall, teaching unit, reception, admissions, offices, a research laboratory, and 4-5 meeting rooms. Another view of the clinical building. Go around the corner to the left and head towards: anatomy, physiology, pathology and associated research laboratories. Straight ahead: anatomy! Make a left once in the doors and you'll go into the lecture theatre, histology lab, or gross anatomy lab. This is the large gross anatomy lab where dissection takes place. Lab coats are required in this area. Here, all the dissection tables have been moved off the floor for oral exams. A menagerie of skeletons, a canine one nearest to the photographer. The radiograph viewers and various skeletal limbs in the gross anatomy laboratory. Another display of skeletons, with a feline skeleton assembled on the white base. Where the majority of schedules, class exam scores, and important announcements are posted for the second year class. Located in the preclinical building. The preclinical building houses anatomy and physiology departments, pathology, laboratories, a lecture theatre, and is attached to the new research building. This is a large room with multiple windows and a good view of the river. There are sofas and billiard tables as well. Luncheons and some meetings are held here. It is located around the corner from the refectory. The common room viewed from the main vet school road. This building houses the Food Farm (cafeteria), the GUVMA shop, and offices/labs. Here's a view of "Allison's Yard". It's near the food farm (you'd turn right to go to the ref) and just off the footpath from the river. Allison's Yard. The university's teaching horses are housed here, and an occasional bull or other food animal. This is the food animal barn. Far left upstairs is the computer cluster. On the right upstairs is the James Herriot Library. This is the South-East view of the Large Animal Byre. Straight ahead is the entrance to the Large Animal Demo Theatre. The Pre-Clinical Building is behind the photographer. This is looking towards the post-mortem examination room from the back gate of the veterinary school (open to pedestrians only). Some of the dairy cows housed in the vet school byre. Sorry for the blur. This red, black and white building is the James Herriot Library. There are all kinds of veterinary journals and other literature here. Straight ahead is the Sm. Animal Hospital, entry limited to clinical year students. Up the stairs to the locker room and eventually to the library. A bright red (autumn colours) Maple near a sign that directs us to the preclinical building. The main entrance to the clinical building for clients/patients. A field on the Garscube Estate (the estate where the vet school is located). Crossed by many people who live at Wolfson Hall. Stairs lead you through the field towards Wolfson Hall. Take this path from vet school to Wolfson Hall. Just round the corner onto the bridge over the River Kelvin. On the Garscube Estate. The leaves of this tree turn a beautiful gold colour. On the Garscube Estate. The beautiful bridge across the Kelvin river on the Garscube Estate (vet school grounds). On the Garscube Estate, sometimes you see fishermen here. 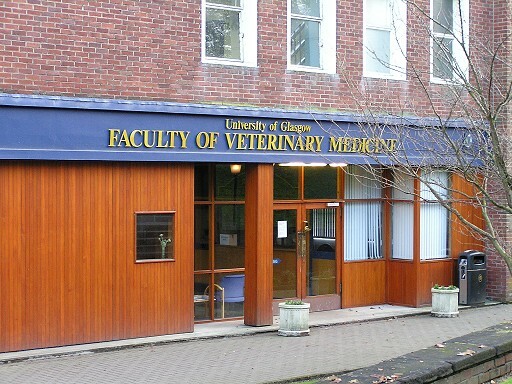 Next to the footpath taking you to vet school. Sometimes malard ducks can be found here. The arena adjacent to the Weipers centre, on the main vet school road. Taking this road to the left brings you to the clinical building, food farm etc. This area is used to assess lameness in horses. The stable unit. It houses the equine patients for the Weipers Equine Centre. Staffed by residents, vets, professors, interns, and final year veterinary students. The stables where patients are housed, viewed from the main vet school road. The lecture theatre within the Animal Health Technology Centre (which is adjacent to Weipers Equine Centre).